My beautiful daughter loved butterflies, so any time I see one, it brings a smile to my face and makes me feel her presence. I miss her so very much each and every day. I made the card with yellow paper. Next I cut the patterned paper to fit and used the distressing tool around it. Then I taped it onto the center of the card. I cut a piece of the same yellow paper to frame behind the image and used the distressing tool around it and the image as well. After rotating the yellow paper toward the right, I taped the image to it, then taped it onto the left side of the card. Next I cut a couple glue dots in small pieces and added them to the back of the fence die cut, then placed it on the right side of the image. Then I glued pieces of the leaves and vines on the fence, over the image and coming from behind the image. 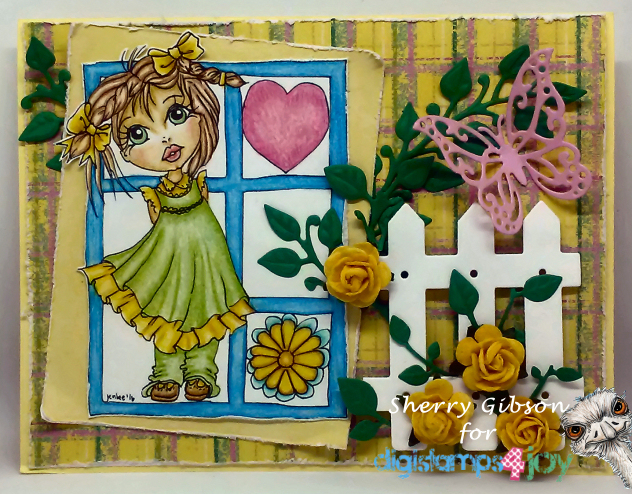 I then glued roses onto the vines and fence and glued the butterfly on the vine above the fence. That's my DT card, I hope you like it and it will give you some inspiration. I entered this card in these challenges. Great creation. Thanks for sharing it with us at Lil' Patch of Crafty Friends. Good luck. Hope to see you again soon. 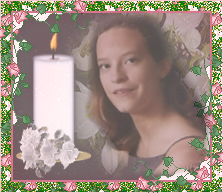 What a beautiful picture of your daughter, Sherry. Annie is right...she is watching over you. Beautiful card, Sherry! Love the roses and that sweet butterfly. I love seeing what you've entered into our "Anything Goes" challenge at QKR Stampede and love being inspired by it. :-D Good luck in the draw. Sherry your card is so precious. Love that butterfly and roses. Lovely card. Thank you for joining in the challenge at QKR Stampede. Beautiful photo and wonderful memories inspired by butterflies. My niece used to call them 'flutterbyes'.....Thanks for sharing your creativity with us at Crafting with Dragonflies. So pretty! Thank you so much for joining us at Scrapper's Delights challenge blog and best of luck with your entry. Love the dies and the gorgeous flowers! The butterfly is the perfect finishing touch.